The world's gadget makers are producing ever more nimble, featured-packed sports watches, but Suunto's Ambit 2 S takes some beating. Reasonably lightweight, at 72g (2.5oz), and well made, this steel-bezelled watch promises special modes for running, cycling and swimming - and a triathlon mode, too. At 15.5mm (0.6 inches) in depth there are less bulkier options, but strap it on a wrist and it stays still when you're running, and feels comfortable on skin. There's nothing particularly flash about the £275 / US$400 / AU$415 watch's quartz screen, but it's always clear when viewed head-on. Tip it to the side and the screen takes on a pinkish hue, but it's still readable, while a light makes it suitable for evening runs in winter, too. However, the real boon of the quartz screen is that it gives the watch a 15-day battery life. The Suunto Ambit 2 S recharges via a nice-looking clamp-on USB cable, though data can take up to 10 minutes to sync. It's a cinch to use. Scroll through the Start menu and you'll find options for timers, a logbook, a compass, navigation, and exercise. The latter includes special modes for triathlon, indoor training, running, outdoor swimming, cycling, indoor swimming and 'other sports' (such as walking or weightlifting). The Suunto Ambit 2 S can measure your swimming strokes if you tell it the pool size, while a separate foot pod is available for runners (though GPS will be enough for casual runners not requiring exact cadence). Go for a few runs, a walk, a swim or a cycle and the Suunto Ambit 2 S finds those GPS satellites remarkably quickly - as in, within a couple of seconds. Its 'Searching for GPS' and 'GPS found!' messages at the beginning of each activity are so speedy they're actually slightly irritating. However, once you've started off it's pretty simple to toggle between the various data pages for distance, time, pace, altitude (via a great-looking graph), heart rate, calories or whatever apps you've pre-customised onto each activity from the excellent Movescount.com website, which it syncs with via USB. We downloaded the Sunrise/Sunset and Beers Burned Off apps, and added them to a couple of activities on the Suunto Ambit 2 S as extra screens. 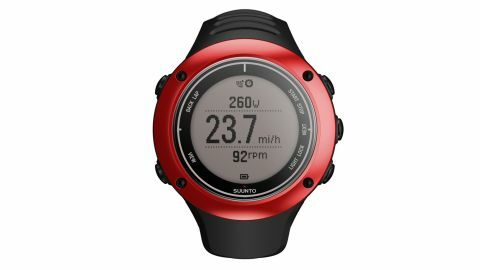 Scratch-resistant and waterproof to 50m (164ft), the Suunto Ambit 2 S is aimed at triathletes, though the GPS chip makes it a decent navigation device for walkers too. Its already impressive battery can be stretched to 60 hours by only talking to those GPS satellites once every minute, rather than each second. However, the watch needs to maintain that GPS link, and it's likely you'll lose the link now and again. We also noticed that during a walk the Suunto Ambit 2 S got the altitude range completely wrong; such GPS-based calculations are hit-and-miss, largely because it needs to see four GPS satellites simultaneously to make the calculation. Those who need to know altitude should buy the step-up Suunto Ambit 2, which adds a barometric altimeter to measure air pressure (which also enables weather predictions). There are a few add-ons available for the Suunto Ambit 2 S. The heart rate monitor we tried out (which costs an extra £50 / US$89 (around AU$85) and comes with a belt to tie around your body), is only compatible with Suunto products, though third-party versions can be used with this watch if they're compatible with ANT+ (a fitness version of Bluetooth). A power meter accessory is also available for cyclists, which links to the watch. A gem for triathletes and Ironman entrants, but reasonably impressive for walkers and trail runners, too, this fabulously made and functional GPS watch's 15-day battery appeals to us. As well as being easy to use despite the myriad options, the PC and Mac software makes customising, updating, syncing and fetching data from the Suunto Ambit 2 S so simple. Kudos to Suunto for its choice of apps too, which this watch makes the most of with its fast-working, multitasking abilities. It's so adaptable and customisable that it's a bit like a universal remote control, though it's strictly for outdoor types.